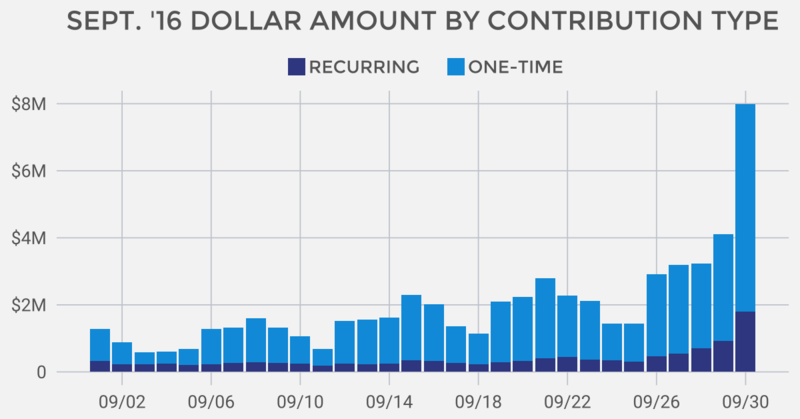 Even though we’re still more than a year away from the mid-term elections, millions of people are engaging with ActBlue’s tools and making small-dollar donations as a way of fighting back. Organizers are mobilizing supporters to fundraise for progressive causes, support local races, and stop harmful legislation from passing. The participation we’ve seen — from both donors and organizations — is astounding. Together they raised more than $27 million last month, fueling an enduring movement that remains strong as we get closer to 2018. 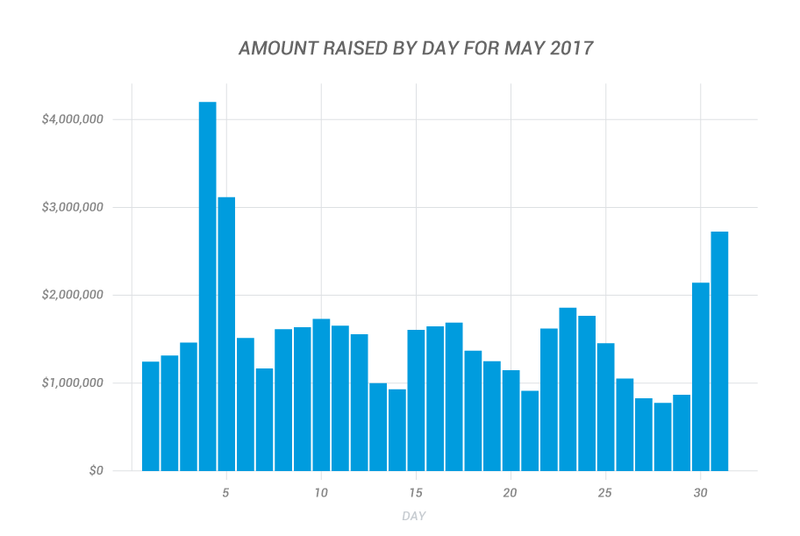 The fundraising total for last month was more than double the total for July 2015, and that increase came from a nationwide effort. 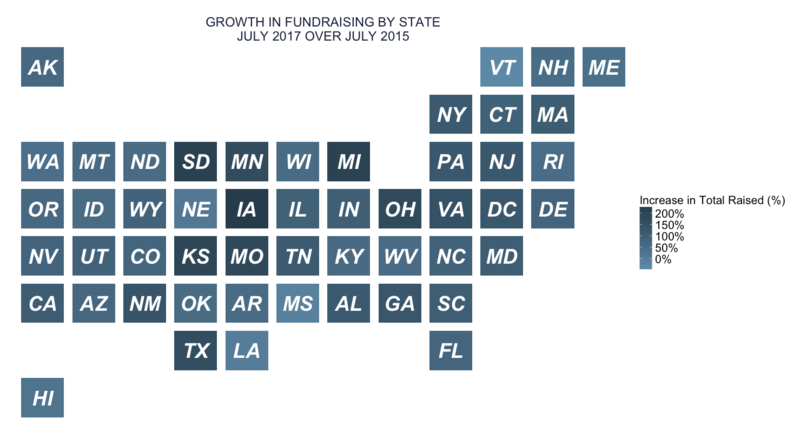 We’ve seen growth across the board over the last two years, but there’s been a remarkable increase in fundraising in states that don’t typically have as much early engagement. For example, fundraising increased by 178.5% in Ohio, 209.6% in Michigan, and an incredible 238.8% in Iowa in 2017 as compared to July 2015. As you can see in the chart below, there’s been a huge spike in engagement in all corners of the country, as donors work hard to fuel the resistance nationwide. 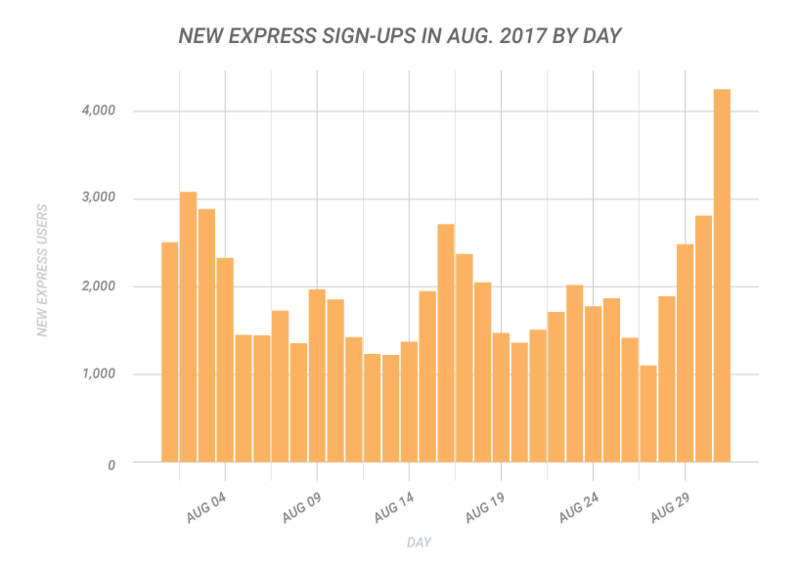 In July, we saw the steady flow of new donors continue. More than 52,000 people became ActBlue Express users and saved their payment information with us, and ActBlue Express users made 66.9% of all contributions sitewide. When donors don’t have to re-enter their payment information and can donate with a single click, they’re more likely to keep supporting the organizations and causes that are fueling the resistance. 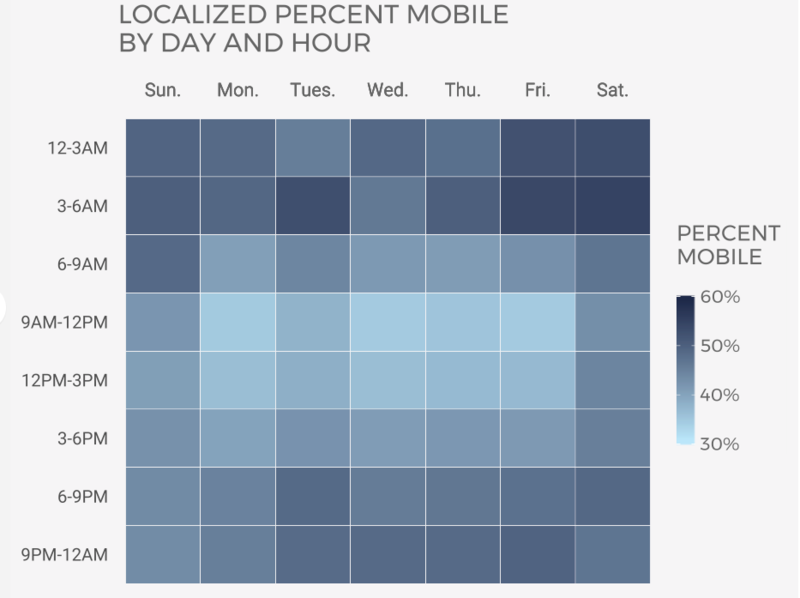 Mobile contributions made up 41.4% of July’s total contributions, making mobile fundraising a powerful tool for the organizations fueling the resistance. 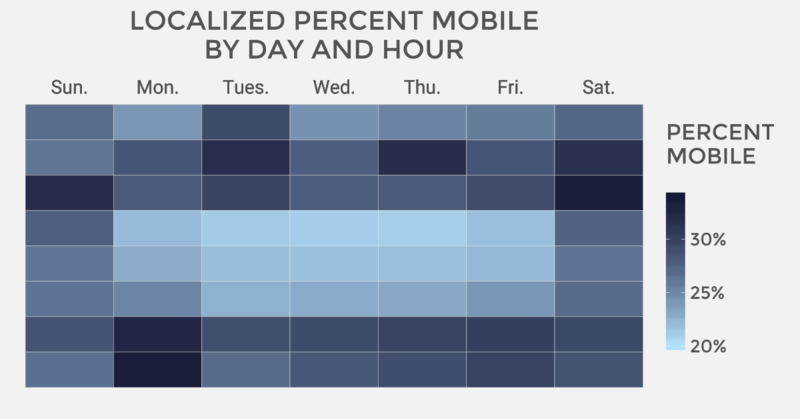 As you can see below, donors are especially active on their phones in the mornings and in the evenings. 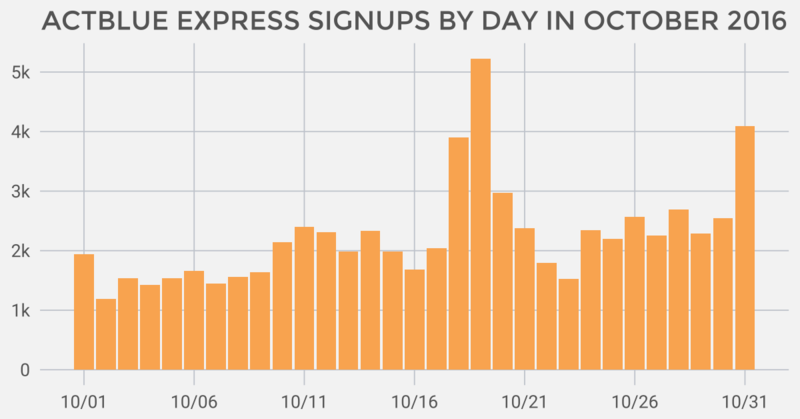 Last month, 42.7% of contributions made by ActBlue Express users came from a mobile device. These are donors who can contribute with a single click right from their phones, and they save time because they don’t have to enter their payment information. That helps organizations bring in more contributions to fuel their crucial work. 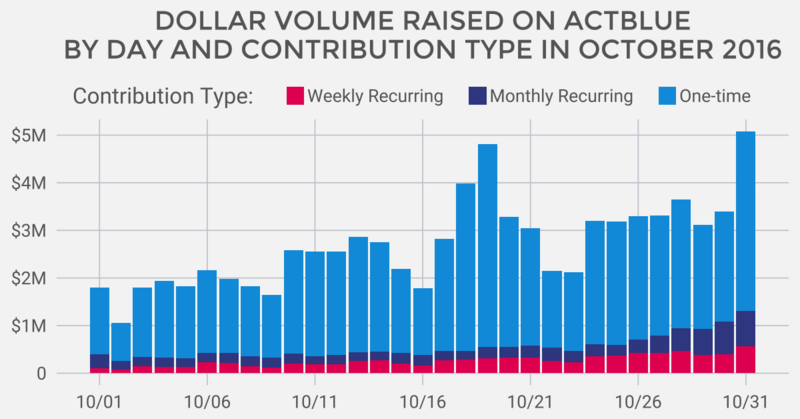 Recurring contributions allow donors and organizations to fuel powerful movements for the long haul, and keep momentum up throughout the course of a campaign or push for change. Donors can sign up and make a commitment when they’re fired up, and the organizations they support can carry on the important work they’re doing well past that initial contribution. 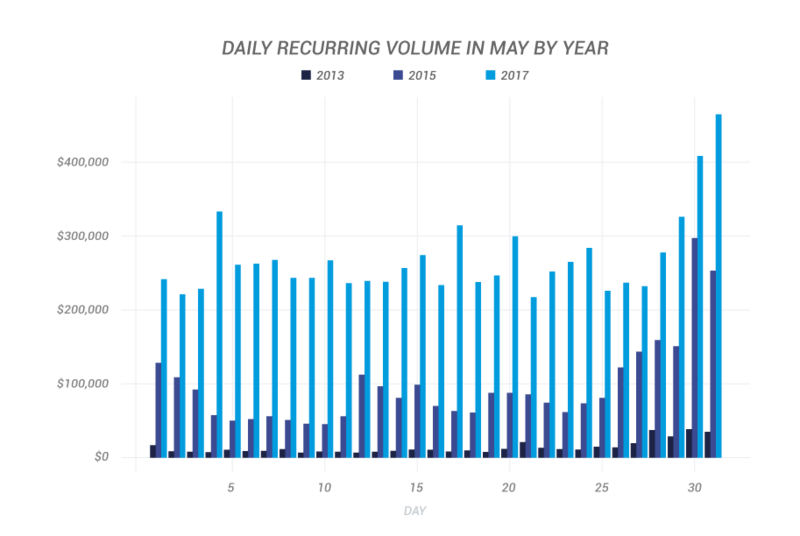 July’s recurring numbers remained steady, with almost 30% of all dollars coming from recurring contributions. Our customer service team works around the clock to make sure donors have the best experience possible when donating through ActBlue. Team members cover every time zone from the east to west coast so that donors can access the support they need as soon as possible. This past month we answered more than 7,000 phone calls and responded to over 18,000 emails, in addition to helping donors via social media. Donors and organizations are putting in the hard work everyday to fight the efforts of the Trump administration and our Republican-controlled Congress, and we’ll continue to be right there with them. If you want to tell us how you’re helping the movement, or if you have any questions about our July recap, let us know at info@actblue.com. In the midst of the holidays and Trump’s impending inauguration, donors and campaigns remained active and engaged. We processed over 750k individual contributions this month. Our rockstar customer service representatives handled over 550 email conversations per day in the month of December. Any questions or comments? Drop us a line at info@actblue.com. Despite the fact that the election took place just eight days into the month, November was still a huge, $43M month. Following Trump’s win, donors and organizers got right to work, turning their anger into action. Our customer service team handled over 300 incoming phone calls per day during November. 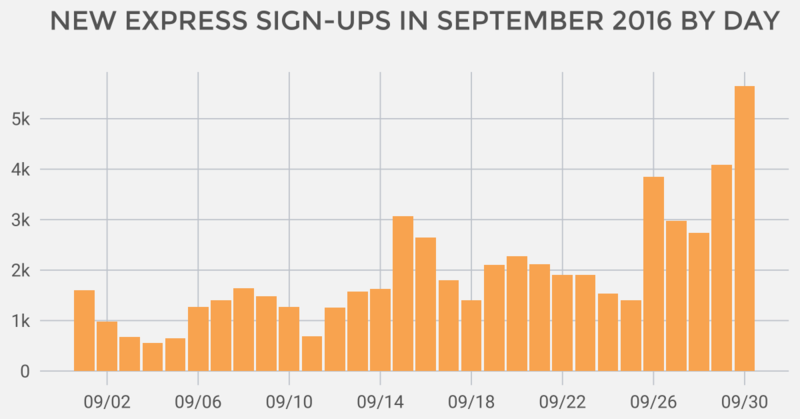 If you’ve got questions or comments about our November numbers, you can reach us at info@actblue.com. 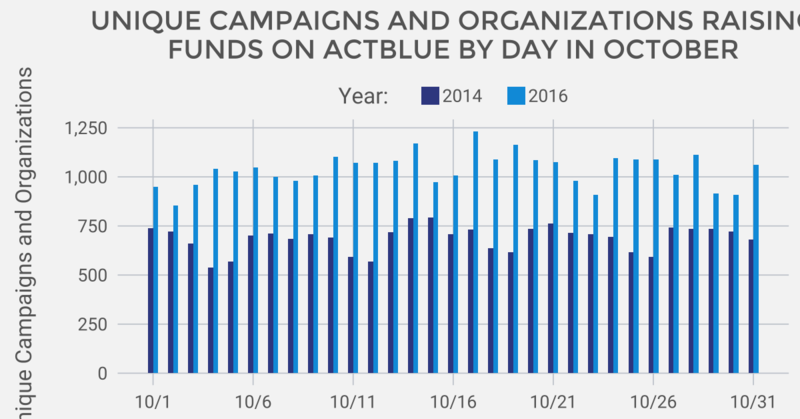 October was a giant month at ActBlue — our biggest month ever! We handled nearly $84 million for over 3,000 campaigns, committees, and organizations. Lots of campaigns took advantage of our weekly recurring feature this month, driving up our total recurring dollar amount. 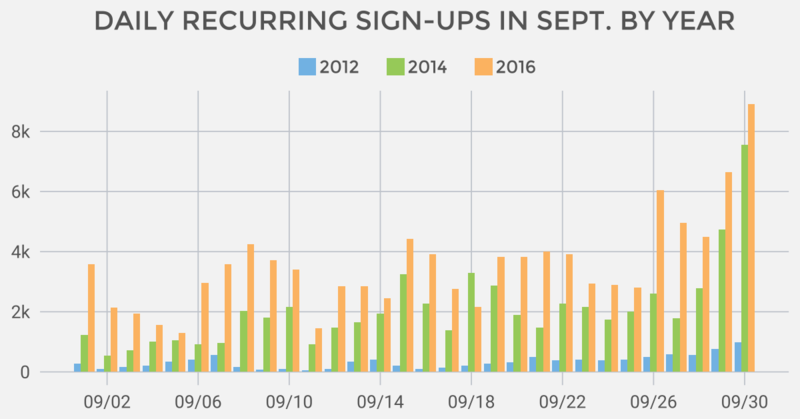 We brought in even more in recurring dollars than during October of 2014, when weekly recurring was a massive success. We thought September 2014 (during the last election year) was a big one. That is, until we crunched the numbers for this past month. We processed more than $58 million in sitewide volume, and handled over 1.2M individual contributions in September ’16. Scroll down to see the rest of the fun numbers we’ve got for you this month. The biggest highlight: Almost 20% of our massive sitewide dollar total came from recurring contributions. It’s a direct result of campaigns and committees taking advantage of our weekly recurring feature in the lead-up to the election. In September 2016 our customer service team handled an average of 814 email conversations a day.